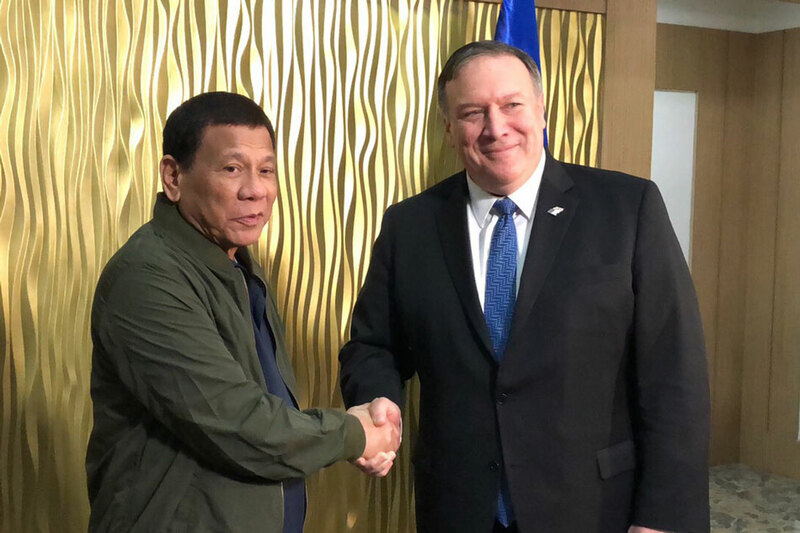 MANILA (2nd UPDATE)--President Rodrigo Duterte met with US Secretary of State Mike Pompeo at Villamor Air Base in Pasay City on Thursday night. The closed-door meeting focused on the two nations' cooperation on bilateral and regional security issues, the US Embassy Manila said in a statement. The meeting between Pompeo and Duterte began at 9:05 p.m. and lasted for less than an hour. Further details of the talks have yet to be released as of this posting. Presidential Spokesperson Salvador Panelo said in an earlier briefing that Duterte and Pompeo will likely discuss issues on security and terrorism, among other bilateral concerns. Panelo added that the Mutual Defense Treaty is expected to be discussed, especially since the Defense Department has said they are seeking to amend the agreement to make it relevant to the ongoing territorial dispute at the South China Sea. After the meeting, Duterte immediately boarded his plane to fly to his hometown Davao City. Pompeo is expected to meet with Foreign Affairs Secretary Teddy Locsin Jr., before leaving the Philippines on Friday. The top US diplomat visited Manila after accompanying US President Donald Trump for his second summit with North Korean leader Kim Jong Un in Hanoi, which ended with no denuclearization deal. Accompanying Duterte were Locsin, Executive Secretary Salvador Medialdea, Defense Secretary Delfin Lorenzana, Philippine Ambassador to the United States Jose Manuel Romualdez, and Foreign Affairs assistant secretary Lumen Esleta. Pompeo's visit comes amid warming ties between the long-standing defense allies, which was tested early in Duterte's presidency when he blasted the Obama administration, US legislators and rights groups for criticism of his drug war. Relations between Manila and Washington improved when Trump came to power and hailed Duterte's actions as a sign of toughness. In an unprecedented gesture in December, the US returned three historic church bells taken by American soldiers as war booty from Balangiga town, Eastern Samar during the Philippine-American war in 1901. The bells are considered a symbol of Filipino resistance to foreign invaders. Duterte first called on the US to return the bells during his State of the Nation Address in July 2017. Duterte made earlier statements saying he would pursue an independent foreign policy, which would temper Philippine reliance on the US and improve ties with China and Russia, both US rivals.